This weekend Category 4 storm Hurricane Harvey, the biggest natural disaster of President Donald Trump’s presidency so far, barreled into southeast Texas, whipping coastal areas with 130 miles per hour (209 kilometers per hour) winds and causing unprecedented, catastrophic flooding in the Houston/Galveston region. Trump, in predictable accordance with what has felt like decades of but is really only a few years of precedent, has mostly responded by tweeting. Trump’s tweets are not reassuring. On Friday, Trump said he would be “closely watching the path and doings of Hurricane Harvey,” adding “BE SAFE!” Later, he seemed to marvel at the 125 mph winds. 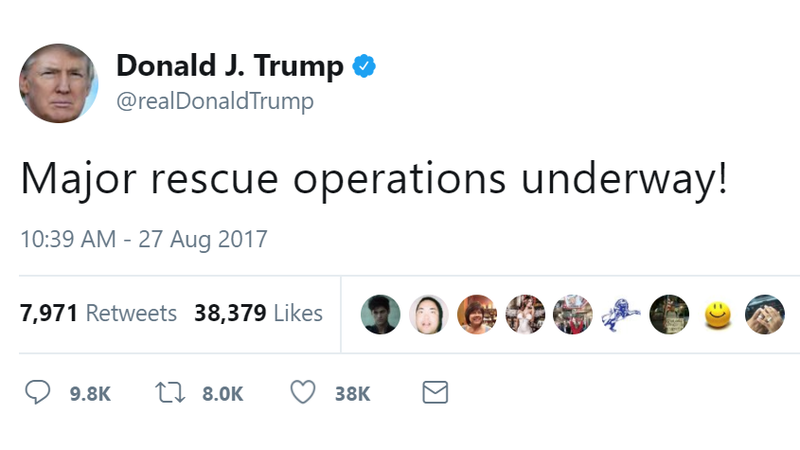 After then using the hurricane as cover to pardon convicted felon and racist profiler Sheriff Joe Arpaio, Trump pivoted to a series of tweets embedding Fox News and thanking emergency services. He also took the time to shoot back at Iowa Sen. Chuck Grassley, who warned him not to make the same mistake President George W. Bush made with Hurricane Katrina (ignoring the disaster until it became a humanitarian catastrophe). “So far, so good! ... City, State and Federal Govs. working great together!” Trump tweeted as large parts of southeast Texas lay devastated. On Sunday, Trump woke up and immediately plugged terrible person and Milwaukee County Sheriff David Clarke’s book, before reiterating that this storm is a real humdinger. Trump returned to rambling thoughts on how Mexico was “one of the highest crime Nations in the world” and how it would pay for his dumb border wall, and theorized he might just terminate NAFTA if renegotiation continues to be “very difficult.” Then he continued to appreciate, slack-jawed, how much damage Harvey was doing. So yeah, you like hurricanes. We get it, Donald. The president of the United States, ladies and gentlemen. Update August 27th, 7:14 p.m.: Yeah, he’s not done.